Biophysics alum, Eric Johnson-Chavarria ('14) has just been appointed as a NIH-AAAS Science and Techology Policy Fellow for 2017. He took some time to answer a few questions for us. 1. What made you choose a science major in college and for graduate school? Since high school, I have always been interested in physics due to my physics teacher Mr. Ormiston. However, at the time I was more interested in pursuing forensics science due to shows like CSI!. That quickly changed once I started research through the MARC U*STAR program at the University of Texas at San Antonio. I worked with Dr. Lorenzo Brancaleon on microtubule polymerization dynamics under varying reagent conditions. This expanded my perspective on research possibilities and led me to the Center for Biophysics and Quantitative Biology program at the University of Illinois at Urbana Champaign. There I engaged in learning microfabrication and microfluidics with Dr. Charles Schroeder to develop a hydrodynamic trapping technique for single cells. 2. What do you do in your current position? 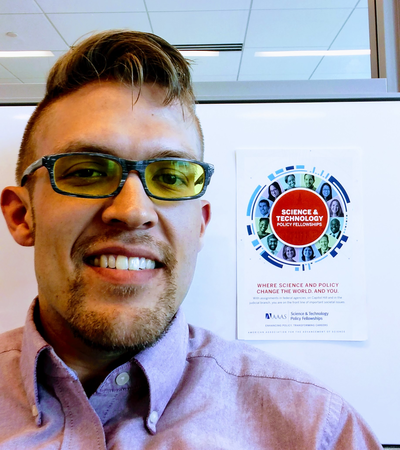 As a AAAS Science and Technology Policy Fellow, my role is to help organize working groups and workshops to address the gaps and needed technologies in cancer research. I am also working to conduct portfolio analysis of technology driven funded awards to demonstrate the impact of our initiatives. 3. Can you tell us a bit more about the Cancer Moonshot Initiative? 4. How did your training in Biophysics prepare you for your current job? My training in biophysics gave me the proper balance between collaboration, teamwork, interdisciplinary research and technique development. This experience and training will help me work with external stakeholders as well internal working groups to address the challenges in bridging emerging technologies in other fields that have high impact potential in cancer research. Innovation and interdisciplinary collaboration will help address the ambitious challenges in the Cancer Moonshot Initiative. I would have to invite to dinner, Forest Whitaker, Edward James Olmos and Ernest Hemingway. While not formally scientists, they have inspired me through their roles in films and their writing. The stories based on their own experiences that they could share over a meal would be invaluable and intriguing. I highly encourage you all to look outside your field for inspiration including social scientists, artists and traveling to other countries. I am encouraged to see many Universities and Institutes of Higher Learning are creating free maker spaces/innovation labs to bridge the divide and foster collaboration to address world challenges.